suitable for dogs & cats. nylon bristles on the one side and tipped, wire bristles on the other. 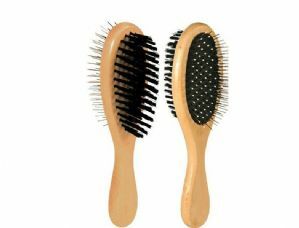 The Trixie Double-Sided Oval Brush can be used on both cats and dogs. Helps to keep a shiny & healthy coat. One side of the wooden brush has wire bristles, which are rubber-tipped to protect your pet's skin; the other side has nylon bristles. The wire bristles can be used to loosen matted fur and areas of dirt in the undercoat. whilst the nylon bristles are ideal for removing dust and making your pet's coat look shiny and well cared for.